Israeli police and Palestinian worshippers have clashed at Jerusalem's most sensitive religious site. 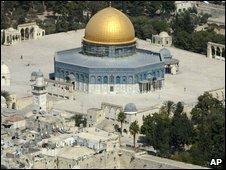 Police arrested 12 people who were throwing stones in the Temple Mount compound, known to Muslims as Haram al-Sharif, a police spokesman said. The site contains the al-Aqsa mosque and the Jewish holy site, the Western Wall. 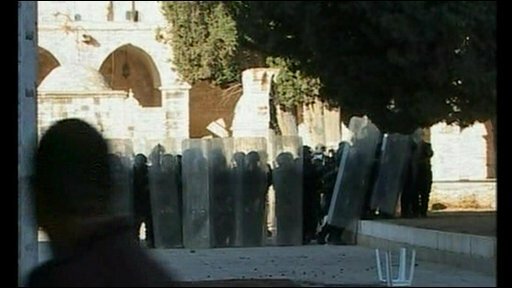 A spokesman said police did not enter the al-Aqsa mosque itself. The clashes came amid rising tensions in the past weeks over the area. On Saturday, Jerusalem police announced they would strengthen policing around the Temple Mount after Muslim leaders urged Palestinians to defend Jerusalem against "Jewish conquest." There have been rumours among Palestinians that Jewish extremists were planning on harming the holy site - though no such attempt has been made. Last month, police used tear gas and stun grenades to disperse 150 Palestinian protesters who had thrown rocks at non-Muslims who entered the al-Aqsa mosque compound. Israeli police said the visitors were foreign tourists, but Palestinians said they were Jewish extremists. In the most recent incident, Israeli police spokesman, Micky Rosenfeld, said 12 people had been arrested. He added: "This morning at eight o'clock a number of youngsters from east Jerusalem started rioting inside the Temple Mount itself. "Our police units entered in order to disperse them after stones and rocks as well as even petrol bombs were thrown at our officers." Security forces used stun grenades to disperse the demonstrators, and officers remain on high alert in the area. Police also said they had arrested the Palestinian minister for Jerusalem affairs, Hatem Abdel Qader, on charges of incitement. Palestinian officials said police had sealed off the compound and that some 100 Palestinian worshippers remained inside. Israel occupied East Jerusalem in 1967 and annexed it in 1981 but its claim to the area is not recognised internationally. Instead, under international law, East Jerusalem is considered to be occupied territory. Palestinians want East Jerusalem as the capital of a future state of Palestine.